PIC/15611/1-12000 LOC Cold store Fairfax archive of glass plate negatives-Fairfax archive of glass plate negatives [picture] //Cars in a traffic jam on Hay Street, Sydney, ca. 1930s [picture]. Vegetable Market No 1 Haymarket. City Architect Robert Hargreave Brodrick designed the new vegetable, fruit, fish and poultry market buildings at the head of Darling Harbour in 1909. Paddy's Market also shifted across from the Belmore Market with its stallholders. 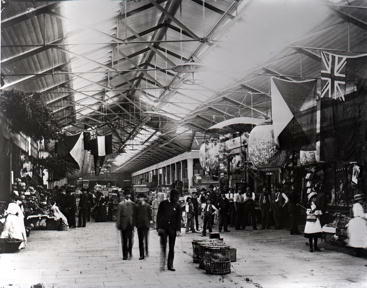 The vegetable market building survives to this day with Paddy's on the street level and Market City shopping centre above.